Today and Every Day. – Walking Humbly. Seeking Justice. Living with Hope. Around the world Armistice Day/ Remembrance Day/Veteran’s Day is observed today, November 11. 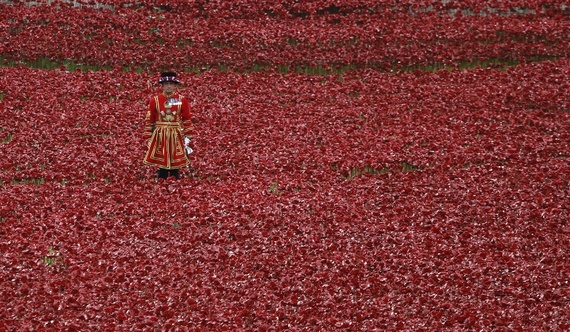 In the countries of the British Commonwealth everyone wears Red Poppies to remember the end of the War to End all Wars–World War I. A reminder of the poppies that grew on the battlefields of Europe. This year is 100 years since the start of World War I. A beautiful tribute was created at the Tower of London of 1000’s of red ceramic poppies to mark those who died in service of their country. In the United States this same day is Veteran’s Day. It is a day to salute and thank all those who have served our country in one of the branches of the Armed Services: Army, Air Force, Coast Guard, Marines, Merchant Marines, or Navy. Memorial Day in May is the United States’ Day to honor and remember those who died in service to our nation. As our troops are still embattled and serving throughout the world keeping peace, we salute those who continue to soldier on whether at home or abroad. Whether helping fight Ebola in West Africa or on the DMZ in Korea, on a submarine deep in the ocean or behind a computer in North Dakota,. We honor you today whether you served in World War II, Korea, Vietnam, Gulf War I or II, Iraq, Afghanistan, Grenada, or aiding those in the Philippines after a typhoon or Haiti after an earthquake; whether you are a field medic, or you are in the infantry; whether you fly a plane, a space shuttle, a drone, a helicopter or drive a jeep.We honor you whether you are an enlisted woman or an officer, on an aircraft carrier or service ship, We honor you today whether you are in the JAG corp or Army Band, or you serve as a chaplain uplifting the spirits and holding the hands of our service men and women. We honor you whether you are or were a computer repair technician or a mechanic, a paratrooper, or ski patrol, Navy Seal, Green Beret, or a cadet at West Point. Thank you whether you served overseas or right here at home, or have served in the reserve on Veteran’s Day we say thank you for your dedication to our American ideals of freedom and liberty and peace. You serve and have served to make a more peaceful world. Thank you for your dedication and service. Today and every day.